Kingwell Oilfield is a contract manufacturer offering Open Die Forging for steel, aluminum, titanium & copper etc. 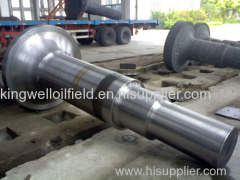 Since 2001, Kingwell Oilfield, an ISO9001:2008 certified company, is into Designing, Manufacturing, and Supply Chain Management for Precision Parts, Standard & Special Fasteners, Custom Components, made from various Metals, Engineering Plastics, Carbon & Graphite. Kingwell is fully equipped to delivermid size to high volume orders for all your forging needs, including secondary coatings and machining operations. We specialize in producing high quality,tight-tolerance parts. We produce aluminum, brass, and steel forgings includingvarious types of alloy combinations. We provide total product and processcontrol, including the tooling and die fabrication to the complete forgingproduction process. With our tooling capabilities we are able to deliver yourpart from prototype to production very quickly. We can also provide secondaryoperations and finishes including face milling, drilling, coining, threading,cold trimming, and others. We provide a low-cost forging solution for a widevariety of irregularly shaped parts such as stems, worm gears, case halves,hubs, and flanges. Our forged parts are used by many industries including propane gas, medical, automotive,aerospace, oilfield equipment, marine, and industrial valve. All forgings are thoroughly inspected ateach stage of production. Quality controls using the latest in industrystandards can be found in each process on the shop floor up to top-levelmanagement. Utilizing computerized process control systems is another way we canassure your forging requirements. We take the extra steps to make certain youare completely satisfied with our final product as well as our committedservice. Experienced personnel, excellent facilities, and a sincere desire to serve our customers make Kingwell a superb choice for your forging needs. From your first contact with Kingwell, you will have confidence in our ability to help your company manufactureoffshore. We stand behind our products and will do everything we can to helpyour company become more successful. We look forward to exceeding your expectations for many years to come. Contact us today to see how we can best serve your company. Any enquiry, pls contact freely!